Kraken Fats, master of the non-Euclidian trick-shot in many of the finer R'lyeh billiard rooms. lulucthulhu would like to thank her Secret Shoggoth for sending her something tentacular as was suggested. I am aware that we share certain interests and preoccupations that most people would find disturbing to say the least. These interests have, of late, been leading down some dangerous paths. It is for this reason alone that I pass on to you the contents of this package, in the hope that they might aid you in your research. I implore you not to open the package until the solstice has come, for reasons I'm sure that a man of great learning, are aware of. The records contained within contain great knowledge, but equally, dire danger. If this was you then you've made my Christmas before I've even opened it sir or madam. If you wish to make yourself known then please do. I've received my Secret Shoggoth, thank you. I'll post a pic after I open it on Christmas Day. Come on guys you have to wait to open them that's not fair. I've been a little remiss it seems, in not thanking my not-so-secret Shoggoth. Since I hadn't opened it yet, I was going to wait till afterwards to thank you. Whatever this mysterious package is, ta very much. It's Christmas morning here already and thank you very much to my Shoggy Matthew aka Lammomedes for the Mansions of Madness. I plan to play through these adventures with my gaming group next year. What's Cthulhu without a spooky house of horrors hey. Thank you also for the beautiful card of British and French Dominions in North America in 1755. Absolutely fantastic! Also to Finn, hope you liked your gifts from me. Good luck GMing Beyond the Mountains next year, I'm hoping your present will be helpful for further inspiration. Looking forward to listening. Now that I've finally opened my present, thanks very much to my Secret Shoggoth for sending me the first book of the Dracula Papers. I always thought Dracula was a bit Lovecraftian, what with the ancient, unknowable threat and the lunatic in a madhouse who dreams of it, so this ought to be a good read. Well a massive thank you to my SS who provided me with DVDs of 'Die Farbe' and 'The Thing.' Whoever you are, you are a scholar, a cast iron gentleman (or lady) and probably an acrobat. Exactly what I wanted and you've made a lowly acolyte very happy indeed. It is warming my heart to see happy shoggies and shoggoths abound. However many are silent as if hiding from investigators. Please let me know if your gift hasn't arrived, if it has then please let everyone know here. A mysterious parcel was slid greasily under my door. After removing the putrifying wrappings, I discovered a shiny new copy of Miskatonic University! A most excellent Yithmas gift indeed. Many thanks Secret Shoggoth!! Upon opening my gifts I was delighted to find not only a Moleskine Notebook and collection of short stories from my favorite living SF author, but also the first volume of the German 2nd edition Beyond the Mountains of Madness! It's so pretty:oops: Every page has illustrations or maps or period photos and the material quality of the book itself is phenominal. A huge thank you to my Secret Shoggoth for the mind-bogglingly gorgeous poster from the HPLHS The Call of Cthulhu film. I am definitely getting that framed and putting it up on my wall. Pictures will ensue. Thank you also for the 1920's ocean liner pack which I already have plans to use in an upcoming scenario. All in all, I couldn't be happier! Thanks so much. And think for using Innsmouth House as well. An absolutely beautiful (or should that be terrifying) Cthulhu mug of gargantuan proportions. 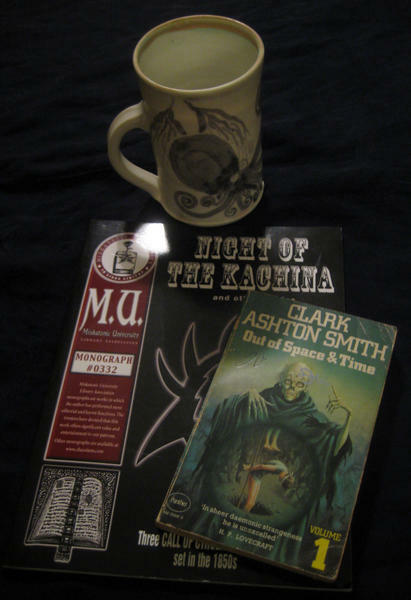 I also found a copy of Night of the Kachina (Chaosium Monograph) and a 1974 paperback edition of Clark Ashton Smith's Out of Space and Time. 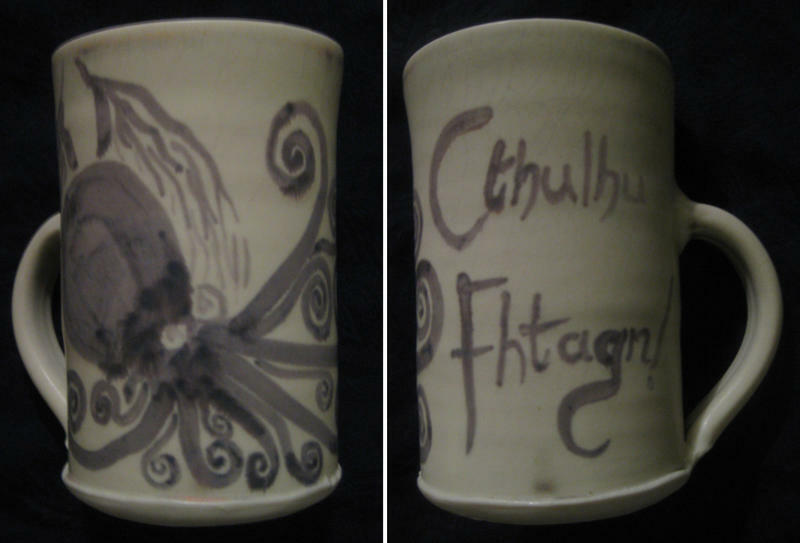 Thank you, Secret Shoggoth (especially for the wonderful mug)! Thanks to CAThompson for organizing Secret Shoggoth VI. While braving the arctic winds of winter while clearing a path for the cultists, a strange creature materialized from the Ã¦ther. Beneath it's vitreous Stygian-coloured wings with their strange pulsating rhythms a single claw emerged bearing a strange package. The strange parcel bared the symbols of the Royal Mail, and the steaming of the skin indicated that it had traversed the unknown planes to get here to my remote Canadian steading. Having reached it's destination, the creature began to dissipate in the air, rising up against the wind. My blood chilled looking at the sight. Turning the package over, I noted that it was indeed a missive from my unknowable compatriot but the briefly scrawled message, would point away from the Isles of Albion. Truly if co-ordinates were correct they were from a point near to that most unassailable continent Antarctica, where that dreaded city in the mountains and the doom of many Miskatonic University investigators lay far far to the south of me. Retiring to my examination room, I held the contents of the package up to the light and was overjoyed to find that it was a Mythos tome I was previously unaware of! The text by the mad Texan Jackson, and the indecipherable scrawls of the insane Wisconsinan Kovalic would present to me the chance of learning the secrets held inside this box. My thanks, oh unknowable one, you have enriched my library immensely! And equally my thanks to CAThompson for arranging this Mythos book club. Please remember to respond everyone. We like to know! I was very pleased to receive HPLHS' Shadow out of Time radio play on Christmas Eve. It's brilliant! Thank you Secret Shoggoth! Just a heads up for those worrying about whether people received their gifts: some people did comment on gifts in the other thread as well, so make sure you check both places. Just your neighborhood observer doing what he does: observes! Thanks to my secret shoggie for sending me some chaos-dollars! Just enough for a copy of the CoC rule-book! Better late than never, I suppose... Mine arrived in a much timelier fashion than this posting suggests (Yithmas Eve Eve! ), and I am quite enjoying my sack (well, thick envelope, really) of loot. Not really a "Secret Shoggoth" but it appears several people had a hand in it. 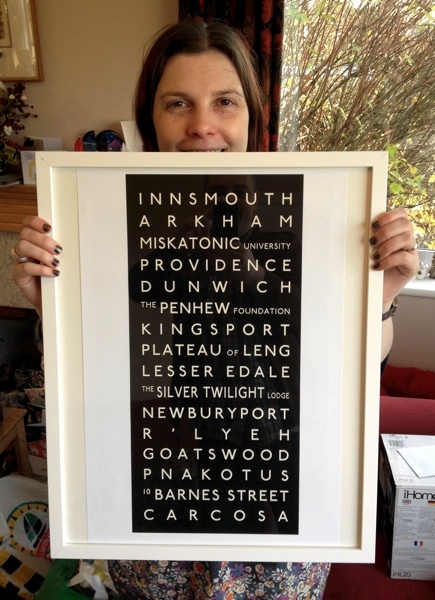 I just had to share (again) this wonderful poster that Helen surprised me with for Christmas.